Kelvin founded these nonprofits in 2015 to focus his 40 years of experience in spiritual self-development, meditation, and corporate business towards helping people worldwide with insights, knowledge, and practical tools to live happier, more productive and enjoyable lives. Through his nonprofit Overcoming the Fear of Death Foundation, he has dedicated his efforts to helping people improve their quality of life through an approach that is based on understanding death more clearly and aligning that understanding more accurately with each of our respective belief systems — whatever they may be. By doing so, each person reduces or eliminates their fear of death — to free up otherwise wasted energy that can be refocused to better use in one’s daily life. 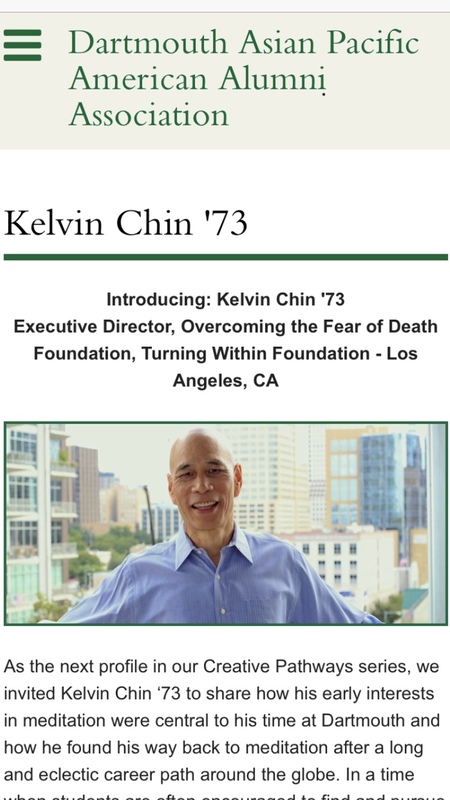 Kelvin is a frequently sought-after speaker at conferences, healthcare institutions, webinars and podcasts to increase understanding about death and dying in order to both help audiences overcome the fear of death and to understand better other people’s beliefs about death and dying. In addition, Kelvin helps people develop a more balanced, productive and enjoyable life, mentally-physically-emotionally, by teaching people worldwide “Turning Within” Meditation via Skype, phone and in-person. To learn more about Turning Within. He conducts in-house trainings nationwide on death and dying for organizations in the healthcare industry. To see Seminar data. Kelvin speaks internationally, has spoken at the Commonwealth Club in San Francisco, and has been on TV in China. His interview in "Business Insider" magazine has had more than 23,000 views, and is a top Google search result for the words “fear of death.” This has led to international interest in his work from more than 25 countries, including England, Ireland, Germany, Switzerland, Canada, Lithuania, China, India, Sri Lanka, Vietnam, Malaysia, Australia, and the Philippines. His interview featured in the Dartmouth Alumni Magazine appears in the Sept/Oct 2016 issue. He is also a Certified Grief Recovery Specialist. In that capacity, he teaches a program that helps people recover from the painful experience of loss that all of us go through in life...whether from the death of a loved one, divorce, layoff, financial setback, or other losses. Kelvin serves as a "Medical Power of Attorney Agent" for those individuals who have no family or friends still surviving or living nearby them, to ensure that those individual’s healthcare decisions are followed in the event they become unable to make those decisions for themselves. Working with audiences on death and dying issues since the 1980’s, Kelvin has taught numerous CLE and CEU seminars for the legal and healthcare industries, and was a state-certified Long Term Care Ombudsman for the California Department of Aging. In the early 1990’s, he also co-founded the Center For Medical Ethics and Mediation, which offered trainings and seminars to healthcare institutions on how to more effectively prevent and resolve conflict in a facilitative and mediative manner. Bringing greater clarity to his client’s thinking in their personal and business life is something Kelvin has applied throughout his 40-year career, including teaching meditation worldwide to more than 1,000 people since the 1970’s in schools, businesses, the U.S. Army and at West Point. Kelvin has lived and worked in 7 countries, and has lectured in 30 of the 50 states in the U.S. He has delivered more than 2,000 presentations worldwide. While at Dartmouth College, he studied at the Université de Strasbourg, France. He is a graduate of Dartmouth, Yale Graduate School and Boston College Law School. Kelvin lives in Los Angeles, California, but travels and teaches worldwide on the phone, videoconference, and in-person. Kelvin Chin has been teaching meditation in living rooms, schools, and businesses worldwide for 40 years. He teaches on Skype, phone, and in-person. Kelvin has taught people of every age group and walk of life — professional athletes, retirees, teachers, students from elementary school to postdocs, construction workers, clergy, and CEOs. He has taught more than 5,000 people this easy-to-learn technique of naturally Turning Within — no concentration or religious affiliation are involved. Kelvin has even instructed Buddhist monks to meditate. Of course, they meditate using their Buddhist meditation as well — that’s what they do in the monastery all day. They say they get more out of their meditations after practicing Kelvin’s technique. So, there is no conflict. There is no conflict because he has removed all religious and cultural trappings from the meditation instruction and technique. He has taught clergy from all religions — priests, nuns, rabbis, ministers, as well as Sikhs, Muslims, Hindus, and atheists. Kelvin was a test subject in the first medical studies on meditation — conducted by Boston cardiologist Herbert Benson, MD (published in Scientific American, 1972). Kelvin also taught the first meditation classes at West Point Military Academy in 1974, and in the U.S. Army on the DMZ (De-Militarized Zone) in Korea. Kelvin teaches both private sessions and group classes worldwide — including Asia, Australia, Europe, Africa, and the Americas. 28 countries so far. He works nights and weekends as well, so if that is a better option for you, let him know. Please indicate the Time Zone you are in, so Kelvin can coordinate calls with you. Kelvin teaches via Skype, FaceTime, Phone, and In-person. For an In-Depth Interview with Kelvin in a Dartmouth College publication, CLICK on the above photo.